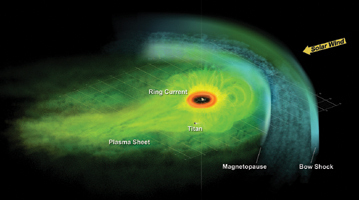 This is an artist's concept of the Saturnian plasma sheet based on data from Cassini magnetospheric imaging instrument. 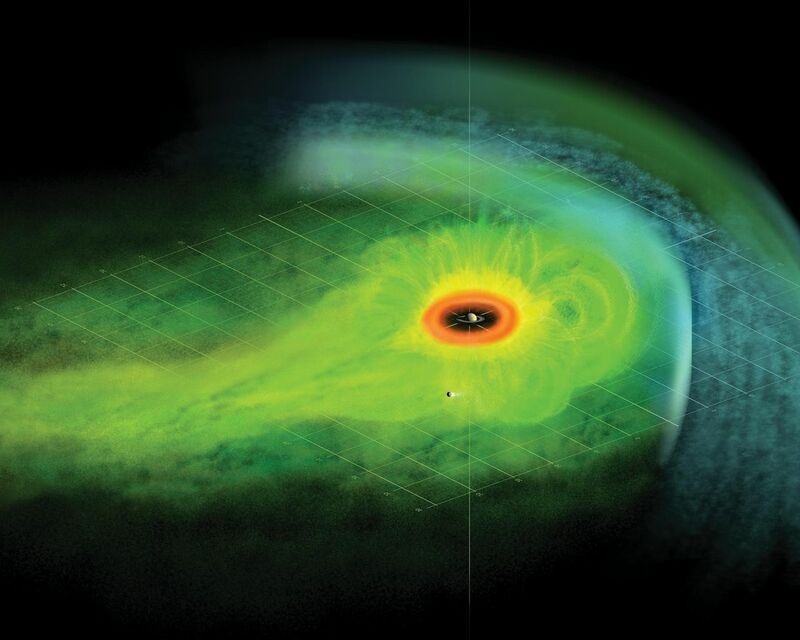 It shows Saturn's embedded "ring current," an invisible ring of energetic ions trapped in the planet's magnetic field. Saturn is at the center, with the red "donut" representing the distribution of dense neutral gas outside Saturn's icy rings. Beyond this region, energetic ions populate the plasma sheet to the dayside magnetopause filling the faintly sketched magnetic flux tubes to higher latitudes and contributing to the ring current. The plasma sheet thins gradually toward the nightside. The view is from above Saturn's equatorial plane, which is represented by grid lines. The moon Titan's location is shown for scale. The location of the bow shock is marked, as is the flow of the deflected solar wind in the magnetosheath. The Cassini-Huygens mission is a cooperative project of NASA, the European Space Agency and the Italian Space Agency. The Jet Propulsion Laboratory, a division of the California Institute of Technology in Pasadena, manages the mission for NASA's Science Mission Directorate, Washington, D.C. The Cassini orbiter was designed, developed and assembled at JPL. 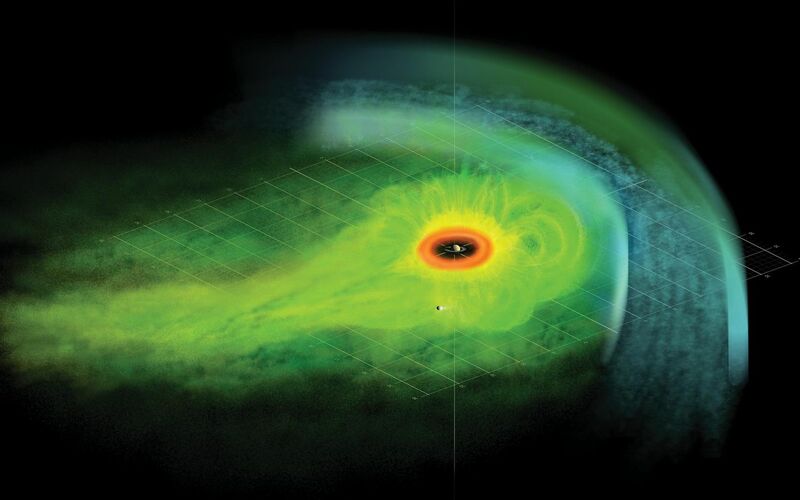 The magnetospheric imaging instrument was designed, built and is operated by an international team lead by the Applied Physics Laboratory of the Johns Hopkins University, Laurel, Md. For more information about the Cassini-Huygens mission, visit http://saturn.jpl.nasa.gov/home/index.cfm and the instrument team's home page, http://sd-www.jhuapl.edu/CASSINI/index.html.